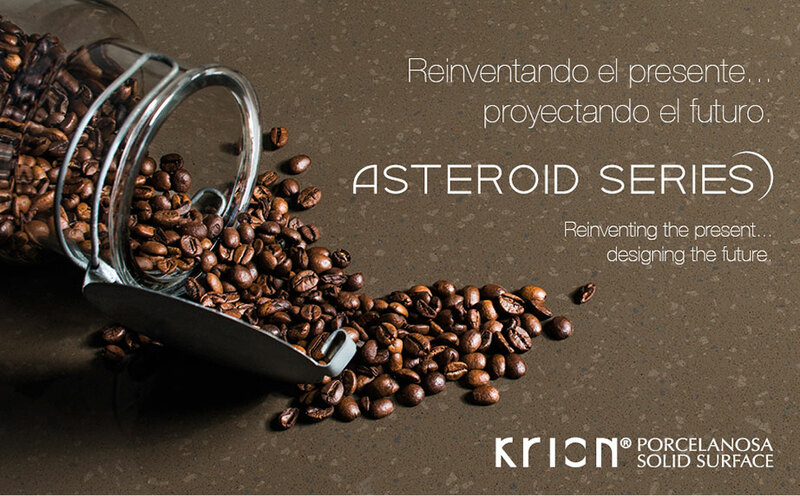 KRION®, the compact mineral from PORCELANOSA Group, at the last display presented the new ASTEROID Series collection. The surfaces of the new designs of the sheets provide an unprecedented sensation in the universe of the Solid Surface, this sensation given by the extraordinary appearance of particles which arise like clusters with an apparent disorder on the surface of the sheet. These clusters are harmoniously integrated in the base of the surface whose main colour, always using tones which are in fashion and without stridency, is full of microparticles which create a peaceful atmosphere on which the clusters emerge. Its colours are of tones similar to the colour of the base and also include the same microparticles. The final result of this combination of effects averts our view from a clear perception of the different elements which form the design of the surface. However, their combination provides a hazy sensation inspired by nebulas, and whose colours and tones are trends in current interior design, thus being easily integrated with other materials and decorative elements.